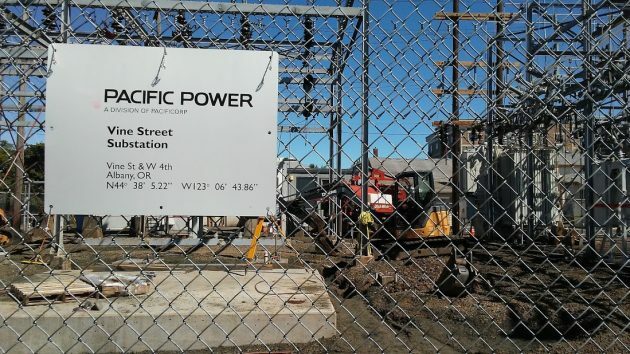 Somebody asked me the other day what the activity at the Vine Street substation of Pacific Power was all about. The short answer is “construction.” The actual answer has to do with growth, and I got it from Pacific’s public affairs section in Portland. So how many customers does the substation serve, and how many more can it handle when the expansion is done by the end of August? I had to look it up: MVA stands for “mega volt ampere” and, obviously, is a measure by which the capacity of transformers is rated. Anything that costs the utility gets passed on to us, so it doesn’t really cost them anything. Looking at the growth and planned growth for N.A., I sincerely wonder if 50 MVA is possible? More customers coming PP!! Demurred. Such a dainty, shy word choice. Growth in demand will continue to require us to rely on fossil fuels until a truly efficient renewable energy source or sources can be implemented. To cut off fossil fuel sources is foolish and impractical. While wind and solar can produce power at prodigious levels, they are currently to unstable to balance the grid without help. (Since the grid has no storage, demand must be immediately matched by production to prevent collapse). HH did a piece on a rapid-start gas turbine with HRSG facility. That technology is a step, but not quite the solution. Until there’s a technology shift that can instantaneously replace 500 MW, it will be impossible to unseat coal as the economically-preferred energy source. One imagines either a large wind farm, swirling turbine blades slicing electricity out of thin air, or maybe 5000 solar mirrors aimed at a salt-filled dome, generating peta-watts of power from the sun – something along these lines will become necessary when the Carousel commences operations. It may even result in construction of a dam-powerhouse operation on the river. Hopefully it’s not too late. Given President Trump’s laser-focus on infrastructure spending, Albany’s Political Class should consider a funding Block Grant through the forward-thinking offices of Energy Secretary, Rick Perry. Greg Walden carried the heaviest water on the House health care legislation. He has Trump’s ear as much as any. Let’s see if Greg could bring home the bacon for a part of Oregon not in his district. He and DeFazio could work across the aisle to solve the Albany Power Shortage crisis before it is too late. This is interesting, given that when we went through the “exercise” of creating a local utility district in Millersburg, Pacific Power was insistent that the Murder Creek substation distributed power to North Albany. They claimed that was the heart of their network. Also rest assured the upgrade to the substation is costing the company $0 and will be added to the ever increasing rate, we all pay. This is not some magnanimous act for the community or the rate payers, this is how Warren Buffet makes his money. Compare your rate year over year and then you will see how this is paid for. Every company (whether free-market or regulated monopoly) pays for equipment expansion and maintenance from receipts. Phrased another way, whoever buys the product pays a company’s bills. A regulated monopoly such as a public utility has some quirks. Price doesn’t necessarily follow acceptable value. It’s set by a regulatory body as are service fees and service expansion. One difference is that “free enterprise” gets to spend unlimited money to try to influence public perceptions of its goodness, or value, or whatever. My own feeling is that I get far better value from Pacific Power than from, for example, pharmaceutical companies.